Grasscycling is the natural recycling of grass by leaving clippings on the lawn when mowing. Grass clippings decompose quickly, returning valuable nutrients back into the soil. 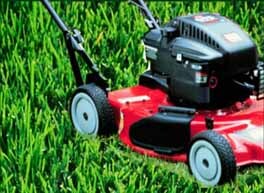 See our Grasscycling page for detailed information. Organic gardening is a method of gardening where the gardener strives to work in harmony with natural systems and to minimize and continually replenish any resources the garden consumes. It entails much more than eschewing synthetic fertilizers, insecticides, and herbicides. It respects natural processes including building healthy soils, using beneficial insects and is focused on making the garden self-sufficient and sustainable. The soil is built from materials such as natural fertilizers and soil amendments as well as mulches and top-dressing. All plant materials are returned to the earth via composting. It recognizes that water is a finite resource and reduces unnecessary water usage as much as possible by mulching, using sound gardening practices and harvesting runoff via rain barrels. See our Composting Basics page for detailed information. Water is one of our most wasted natural resources; probably because it is so plentiful in some areas of the country such as NJ. Recent studies suggest that ensuring safe and sufficient water will be one of the major issues facing us in the coming decades. Despite the fact that ocean water covers over 70% of our planet, there is a finite supply of the freshwater needed to stay alive. The numerous stresses on that supply include, but are not limited to: (1) climate change, which will cause longer and more frequent droughts, shrink water supplies and lead to saltwater incursion; (2) exploding population growth which results in building in locations where freshwater supplies are insufficient; (3) lack of proper water sanitation, where water can become tainted with any number of diseases and parasites; (4) agricultural pressures; and (5) pollution. Minimizing the amount of water you need to manage your property will benefit the environment. (1) Harvest rainwater where allowed with rain barrels. (2) Install a rain garden to collect and filter water runoff – see our Rainwater Harvesting page for more information. (3) Landscape your yard with native plants. They are adapted to the area and need less supplemental watering. (4) If you must irrigate, water your lawns and gardens in the morning to minimize evaporation. (5) Reduce the amount of water guzzling lawn on your property and help reduce some of our vast suburban monoculture. Replace it with a garden. If you include native plants even better! Manicured, tended lawns, though beautiful, provide very little habitat for wildlife. And, BTW, your lawns don’t have to be perfect! An array of green plants in your lawn is perfectly fine. It goes without saying that trees add beauty to your landscape so you should do everything you can to preserve your existing trees and plant more when you can. Proper maintenance is essential (Check here for our tips on proper mulching.) Here is a list of some of the benefits you gain for maintaining the tree canopy in your yard and our town. Can you think of more? Trees help reduce runoff by capturing rainfall and allowing the water to flow down the trunk and into the earth below the tree. This prevents storm water from carrying pollutants to the ocean. Many commonly used household cleaning products consist of some pretty harsh and very environmentally damaging chemicals. They go down the drain and flow through the sewage system to a treatment plant (or into your septic tank), and then the water is expelled back into the water system. Check out our recommendations for greening your cleaning.